As the newest addition to the line, the Delta Cruzer miter saw is a solid performer. The almost frictionless guide system and the front adjusting bevel settings make this a saw to contend with. No one can argue that a miter saw is a must have for the professional woodworker. Whether you are cross cutting stair treads or burning through some 8-inch crown molding, a quality miter saw is a money maker. At the shop we have several of the best saws on the market so when the folks at Pro Tool Reviews asked if I wanted to review the new Delta Cruzer miter saw, I was a little skeptical. What could Delta bring to the table that the other guys do not? And what kind of a name is “Cruzer “ anyway?? Captain Festool – my son Matt to the uninitiated – brought it to the shop and after several weeks of use, I am ready to share my findings. The saw arrived in great condition, well packaged and undamaged. All of the accessories and parts were there and ready to unpack. So far so good. I installed the saw on a universal stand and began setup. The Delta Cruzer needed several adjustments to true up the cuts. It’s not unusual to need some calibration when you bring home a new saw and periodically throughout its life. You should always start by calibrating your miter saw no matter who makes it. The miter scale was off about 3 degrees but using the onboard Torx wrench, I adjusted it square. The miter gauge was also off about 3 degrees but again was easily adjusted. Once set up, I immediately replaced the wood chipper of a blade Delta provides with a quality trim blade. This is another recurring theme with miter saws out of the box, so it’s not a knock against Delta. With the exception of Festool and Makita, nearly all miter saw blades get an immediate swap with the Pro Tool Reviews team. When you begin to use the Delta Cruzer, you will immediately notice the guide arms which Delta named “Robot” arms. Silly name aside, the articulating system is really very smooth and stable with just a small amount of play at full extension. I especially like the adjustable travel tension – this thing moves when you breathe on it if you want it to. In addition, the guide system allows the machine to set much closer to the wall than most miter saws in its class. Another feature that’s pretty handy is the full front adjustable bevel control. A lever at the front of the saw allows you to adjust the bevel without the dreaded reach around that many of the competition favor. The bevel system is easy to use, has just enough friction unlocked to keep the saw head from slipping too easily and locks securely at any angle. With all of the necessary detents in place for repetitive cutting at bevel and miter, this is an effective function-forward design. The Delta Cruzer boasts one of the longest crosscutting capacities in its class and even has a nifty drop down fence system that allows you to increase your cut capacity even further. But to be fair this option requires the addition of a milled piece of lumber to work, so it’s not a great option for me, being as impatient as I am. One item that is lacking with the cruiser is any sort of blade guide. There’s no laser beam or light shadow to guide the blade before the cut. Delta misses the mark on this one as all of the saws in this class have this feature. That will be an easy upgrade for Gen 2 – and most of the Pros at PTR prefer the shadow, just in case there’s a project manager listening. There are two things that all great miter saws have in common – power and accuracy. In the field test, I crosscut some two-inch oak for the power test. The Delta Cruzer performed well and has plenty of power to handle the task. You have to pause momentarily to let the motor spool up to speed but that is due to the “soft start” technology that adds life to the motor and helps reduce the jerk you find on some saw startups. If you let the blade do the cutting you will be fine, even in hardwood. 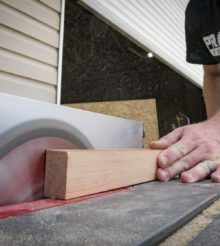 To be accurate at any angle or bevel, a miter saw needs to be machined to very tight tolerances. At full extension, the Cruzer does exhibit a small amount of play. With a full stroke cut of heavy material at 90 degrees, the variation is about 1/32”. That’s certainly within most user’s tolerances but it’s not perfect. However, it’s very similar to what the PTR crew found with Bosch’s articulating model. Dual bevel cuts for crown are also within tolerance and are comparable to other upper tier miter saws. Keep in mind that, as with all miter saws, a sharp blade and patient hand will lend superior results. Dust collection is pretty average. If you’re used to something on the high end like a Festool Kapro, you’ll be unimpressed. However, it falls in line with what I’m used to from my DeWalt miter saw. As the newest addition to the line, the Delta Cruzer miter saw is a solid performer. The almost frictionless guide system and the front adjusting bevel settings make this a saw to contend with. While I personally believe that the cutting capacity of sliding saws tends to sacrifice accuracy, Delta’s unique “Robot” arms keep the play to a tolerable level. As with all new technology, time and wear will tell that tale. Thus far I am impressed with the saw. With the five-year factory warranty and $599 price tag, it is definitely worth a shot to add this beauty to your arsenal. At the same price, the Bosch also has no blade guide. I have the 12″ 26-2250 model. I love the saw and found the saw was in no need of adjustment right out of the box. I use my saw in a workshop attached to a dust collection system. With the ports underneath the table insert, it throws cuttings everywhere. I am still trying to figure out a method of dust collection for this new saw. My 36-322L saw was very effective at capturing the dust made by the blade. Anyone else have the same problem with suggestions?